Indian classical music is basically split into two branches. The northern Hindustani tradition, influenced by the musical traditions of the Mughals, and the southern Carnatic tradition which largely remains culturally devotional in nature. To Westerners, and to many even in India, Indian classical music is simply a melody without a specific beginning or a definite end. To them it is more a gymnastics in sound, and to a few, unnecessary flexing of the vocal chords. As such, to many, its technicalities seem a little too baffling. A little basic knowledge about various sections of a recital is necessary, before one may start appreciating Indian classical music. Probably the most striking difference between the Western and Indian classical traditions is the importance of improvisation in the latter. While Western music has written scores, an Indian classical performance is extempore. The overwhelming majority of Indian recitals are improvised on the spot, making each performance unique and unrepeatable. The musicians may almost never have practiced together, and it may be unusual for any musician other than a soloist to have a clue what will be performed. Given this, it is mind boggling to see the speed with which incredibly complex Ragas are improvised by the performers, with vocalists, instrumentalists and percussionists engaged in creating an unified interaction of rhythm and melody that is precisely calculated to bring out the essence of the Raga and mood, set out in the composition. The improvisational nature of Indian music requires the artist to take into consideration the setting, time allowed for his concert, his mood and the feeling he discerns in the audience before he begins to play. The traditional recital begins with the Alap section – the serene exploration of the chosen Raga. Just like an hors d’oeuvre (appetizer) served before the main course of a meal. After this slow introspective beginning, the musician moves on to the Jor. In this part, the basic theme of the Raga is elaborated and the artist tries to bring the emotional mood of the Raga to the surface. There is no drum (Tabla) accompaniment in either Alap or Jor. The Alap and the Jor evolve into the Gat or Bandish, the fixed compositions of the Raga. The Gat is divided into two parts called Vilambit and Drut. Vilambit is set to a slower tempo, while Drut is the fast composition. Here the drums enter with the rhythmic structure of the Gat and its time cycle, the Tal. The step-by-step acceleration of the rhythm in the Gat finally culminates in the Jhala, the final movement and the climax of the Raga. Here the music becomes more and more playful and exciting. Often, in vocal music, the artist erupts into a Tarana, a type of composition in Hindustani vocal music in which certain meaningless words and syllables (e.g. ‘todani‘, ‘tanaderena‘ etc) are used in a medium paced (Madhya) or fast (Drut) rendition. It was invented by Amir Khusrau and is now common all over India. Carnatic music has something similar called Thillana which is widely used in dance performances. At the conclusion of a recital, the musician may choose to play a Thumri or a Dhun. 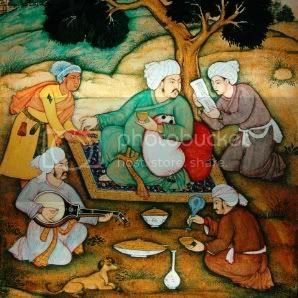 This is a variation of Indian classical music, evolved during the Mughal rule. Here the artist has freedom to go beyond the scale of the Raga.